Visual Studio Code is an excellent open source text editor.You can use it for developing different types of applications such as Python applications and .NET applications. ML.NET is an open source framework for developing Machine Learning applications using .NET framework.You can use C# for developing ML.NET applications. You can develop ML.NET applications using Visual Studio or Visual Studio Code. 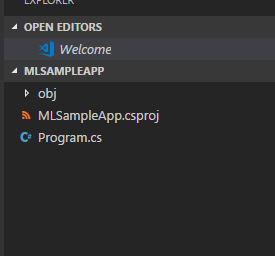 Using Visual Studio Code for creating ML.NET application. add reference to ML NUGET package using the following command.ML.NET is used as a set of Nugets in a application. info : Writing lock file to disk. Path: "..path"
log : Restore completed in 19.39 sec for "..path\MLSampleApp\MLSampleApp.csproj. Now ML.NET package has been installed and you can start developing ML.NET applications. Now run the sample application by selecting debug start debugging(F5 key).Compiler will automatically try to install the missing packages and you will get the following message.Your application should launch after the packages are restored.